Most yacht crew are compensated every payday, via wire transfer or check. But for some yachties, the only way to get paid is the hard way: by filing a lawsuit in federal court and literally arresting the megayacht for back pay owed. While many captains and crew are reluctant to initiate expensive litigation to arrest the boat they’ve served on, pursuing their seaman’s lien is the best route for compensation. If the legitimate amount due is well over $10,000, crew should stand on their rights and act on their valid claim immediately. Once the boat disappears over the horizon, it’s hard to enforce your position and collect. Captains and crew are in a first position to recover monies owed by the boat, after court and custodial costs are paid. Their wages are top priority in court, ranking ahead of the ship’s mortgage, fuel, dockage and subcontractors owed. Yachts have a legal personality and the vessel itself, not the boat owner, is the party to sue. When a boat owner runs out of money, the only source of funds may be the boat, which is liquidatable through a marshal’s sale. Critical mass shifts once a boat is arrested and a lien can be recognized, so captains and crew must decide when enough is enough. Necessaries include services and goods from vendors and subcontractors. 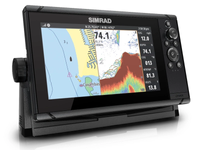 Arresting a yacht is a way that shipyards, riggers and other vendors can attempt to force a yacht owner to pay his bills. The court issues an order instructing the marshal to serve an arrest warrant on the vessel for payment on a lien for necessaries. Then the vessel is in court custody until the judicial system runs its course. 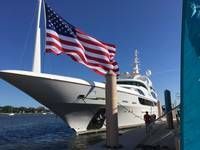 Sometimes, the yacht owner will post bond in the court registry to get the boat operational to travel, particularly in the case of a charter yacht that can’t make money while under arrest. 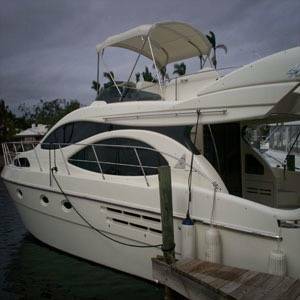 Once bonded, the yacht owner can fight the lien and argue over the money in dispute. The lien is recorded on the abstract of the title of the boat mortgage, although it’s difficult to record claims on a foreign mortgage. While mortgages are recorded, it’s difficult to verify if a yacht owner ran out on a bill if a lien wasn’t filed. In a nonjudicial sale, liens follow the boat when it is seized and not bonded out. In a court ordered sale, the US marshal sells the boat to pay its debt. 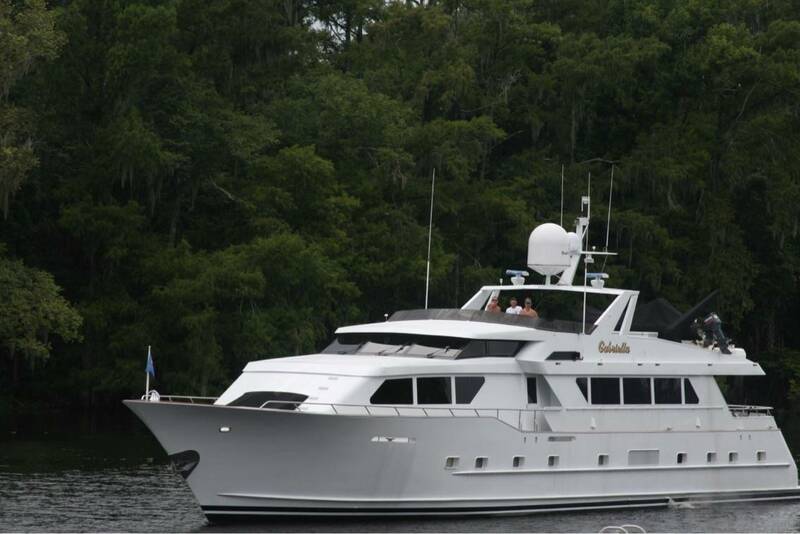 The buyer gets a boat free and clear of all liens in a marshal’s sale. After the seaman files their complaint in US district court, the judge issues a warrant for arrest of the vessel. 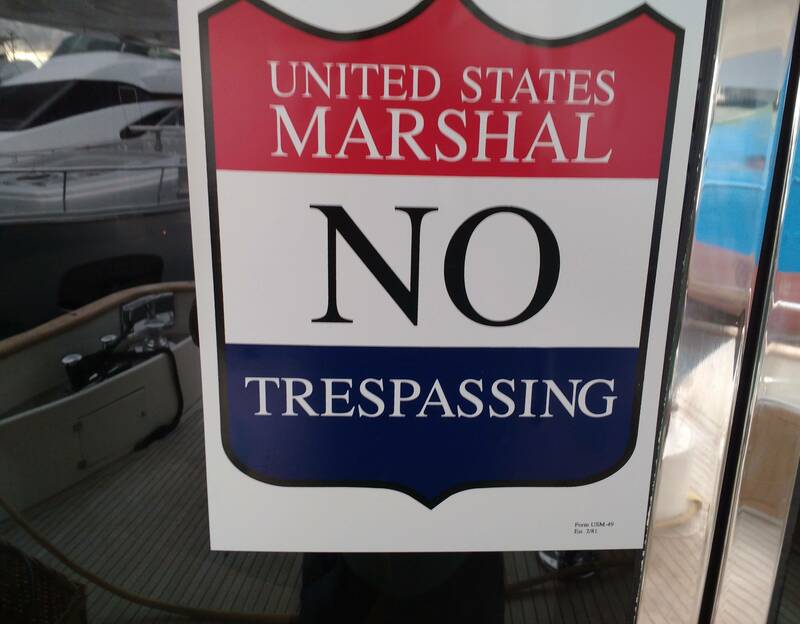 The marshal executes the warrant and arrests the boat in that court’s jurisdiction and applies the marshal’s seizure sticker. The custodian tows the boat to a designated location where dockage fees add up quickly if the judicial process is slow or if the yacht owner drags things out in court. Arrests can occur when the yacht has a lot of repair work if spending is out of control on a refit gone rogue. 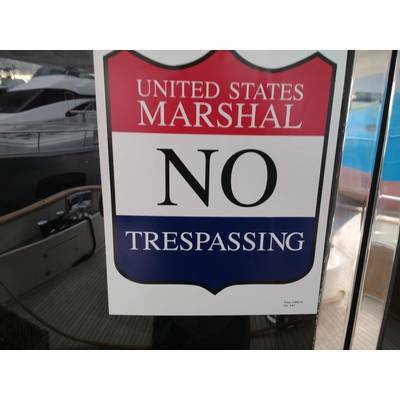 The marshal is the long arm of the law, enforcing a federal court’s arrest order to seize a vessel, but the marshal is never present at a repo, which is a private matter. A repo is undertaken by a bank when the boat owner is delinquent on their loan payments; the vessel is recovered as collateral. The bank exercises its right to self-help for a past due mortgage during a bank repo. Their repo agent conducts an asset search to recover the vessel for the bank. If an arrest is likely to take place in England or Wales, the boat owner may work with the bank for a guarantee or insurance. Toney repossessed an amazing 33,000 vessels since 1998. The majority of past due balances run about $30,000. Only four or five-percent of his repos are megayachts over 80 feet. Toney’s company has likely auctioned over a billion dollars of boats over 20 years. Toney established a successful one-stop shop. 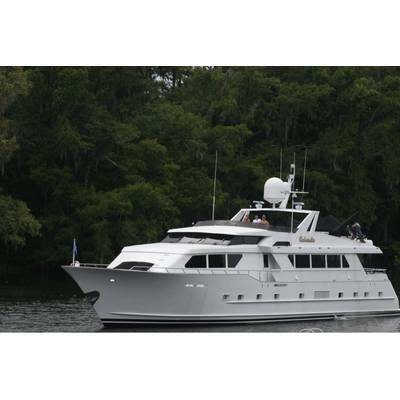 Sometimes, he even buys necessaries claims from crew or vendors and pursues their lien while he auctions the boat. “I will set it up for crew,” said Toney, adding that after evaluating a claim, he won’t pay 100 cents on the dollar for the claim, but will make it worthwhile to take over their lien. Cage advocates the seizure is an interruption for working crew, as the boat’s next owner may hire the previous captain and crew. While crew have a legal right to be paid, they don’t have a right to stay on the boat or fight the seizure. It’s breaking the peace. During an arrest, the marshal orders everyone off the boat, with the authority of the court and a gun in his holster. It’s difficult for crew to gather their belongings, so the custodian inventories the boat and sends a personal property letter to crew. Cage warns captains and crew about snow jobs. 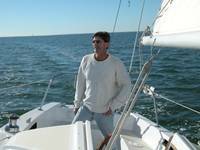 A yacht owner in a financial bind may tell crew the bad repo guy is gonna screw them - then they’ll never see their money. Opposition crew remain loyal (to the owner) and attempt to hide the boat. Cage jumped on a plane, tracking the boat from the Bahamas to Florida, and watched it pull into Pier 66. The captain’s wife had her limit with the wild goose chase.